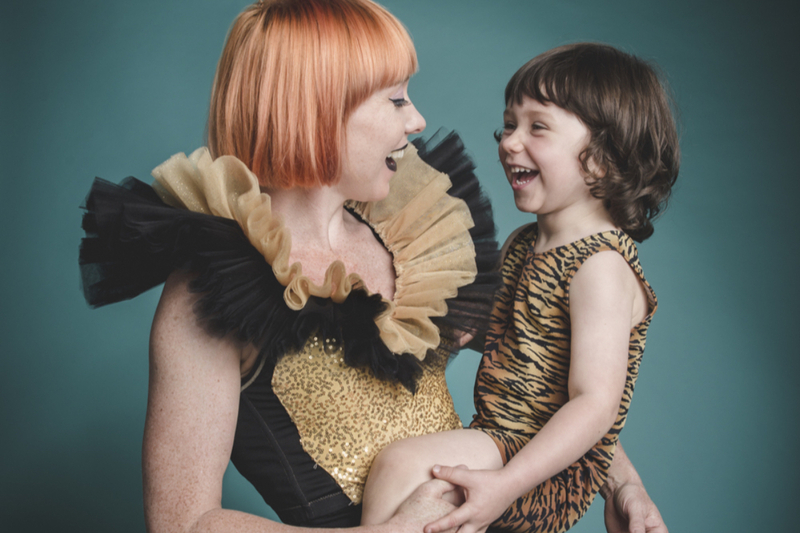 In many ways all working parents can claim to be career jugglers, but circus artist Anna Lumb is the real deal! A circus and hula hoop dynamo famed for her hilarious physical comedy and wildly entertaining theatrics, Anna (AKA Super Amazing Giant Girl) has performed for kids of all ages all around the world, and will be performing at the Melbourne International Comedy Festival in her original show this month. But it’s her adorable son Sonny who gets a front row seat to the best performance of Anna’s life—mum. Anna shares the challenges of juggling her career and motherhood: keeping Sonny entertained backstage, breastfeeding on tour, and finding ‘me time’. Your job is an unusual one, can you tell us about your career journey? I began as a gymnast and dancer and desperately wanted to perform, but was told at school it wasn’t a viable career option. During a four-year stint at art school, I took a performance art elective and the fire was reignited. Soon after, I auditioned for a company called Strange Fruit and within a month of auditioning I was touring the world. The allure of travel and working alongside other reprobate artists was pretty irresistible for a young twenty-something. I was hooked! The juggle is very, very real for you! 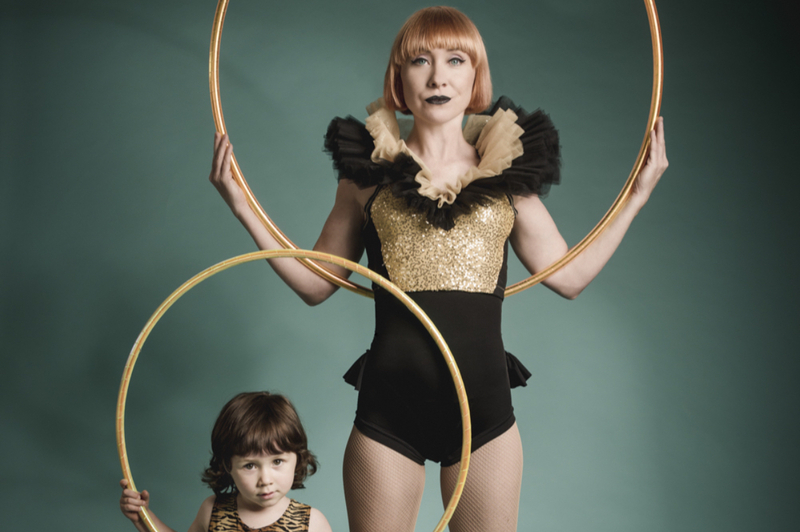 How do you handle the juggle of motherhood with your work as a circus artist? It’s all logistics for me, and often Sonny will come along to shows, rehearsals and on tour. Fortunately, the art community are mostly supportive of this and I’ll often find him being entertained by another performer backstage. Or, at rehearsals I’ll create an obstacle course for him to play on. Needless to say, I have changed nappies and breastfed in some very unusual places. I’m a lot more discerning with the projects, contracts and gigs I accept. I used to say ‘yes’ to everything and I simply can’t afford the time anymore. It’s been great in the respect that it’s forced me to focus on what is important to me with regards to my practice and growth as an artist. The most difficult thing is being away from my son for extended periods on tour. It happens less frequently these days, but as any parent who is required to travel for work would understand, it’s certainly a case of the ‘divided heart’. The lack of sleep! Which is not so dissimilar to rigorous touring schedules so I possibly had some preparation! But seriously, I think above all else my compassion for others has grown. Not to say I was indifferent before having Sonny, but I feel like I have a greater empathy for others and am more observant of the world around me. Every mother wants more ‘me time’. How do you find it and what’s your favourite thing to do for yourself? You grab micro moments! A coffee or a wine with a friend, a podcast at the gym, a book before bed. I’m happy if I get to train or exercise each day even if it’s for only 20 to 30 minutes. Holidays don’t really exist in this industry as we’re mostly all self-employed so you have to make dedicated time to do nothing. That’s actually one of the biggest challenges. Hard to name just one: ride the Trans-Siberian Railway, learn electric guitar, act in a feature film … I’d like to travel more with my son. There are many things on the list! Lastly, the best advice I was ever given by another mum is … be kind to yourself, you’re doing an awesome job! Super Amazing Giant Girl will be performing as part of the Melbourne International Comedy Festival, 6 – 21 April 2019 at Melbourne Town Hall.